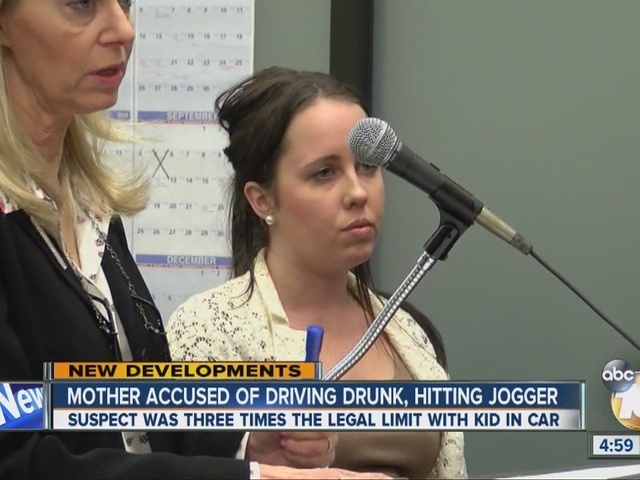 A motorist whose toddler was in the back seat when she allegedly struck a jogger in Pacific Beach while drunk, then hit a parked car, pleaded not guilty Tuesday to nine charges, including felony DUI, hit-and-run and driving without a license. Amanda Mae Brodd, 26, faces nine years and six months in prison if convicted, said Deputy District Attorney Matthew Dix. The prosecutor told Judge Jay Bloom that Brodd hit a car in the parking lot near the roller coaster in Mission Beach the night of Feb. 15, then took off instead of remaining at the scene. Brodd drove three miles and turned onto Crown Point Drive, where she missed a turn, drove onto a sidewalk and hit a 23-year-old male jogger who was running away from her, Dix alleged. The jogger, who is an emergency medical technician and ambulance driver, was thrown onto the hood of Brodd's car and suffered a broken pelvis and leg, the prosecutor said. After the 6:15 p.m. accident, Brodd allegedly drove off again. She eventually hit a parked vehicle on Lamont Street, which disabled her car, and she was kept at the cene until officers arrived, Dix said. Brodd -- who was on probation for a 2011 misdemeanor DUI conviction -- refused a required breathalyzer test and was arrested, according to the prosecutor. Her 3-year-old daughter was found unhurt in the back seat, but the child's car seat was not installed properly, Dix said. The defendant -- who was driving on a suspended license -- had a blood-alcohol content of .26 percent after the accident, more than three times the legal limit for driving, Dix alleged. During the blood test, Brodd allegedly kicked a police officer, the prosecutor said. Brodd was supposed to appear at the Vista Courthouse today after being cited recently for driving on a suspended license, the prosecutor said. The judge found that Brodd is a flight risk and a danger to the community and raised her bail from $100,000 to $175,000, resulting in her being taken back into custody. A bail review was scheduled for Friday, along with a March 3 readiness conference and March 7 preliminary hearing date.